The holidays are wonderful, but they can also be incredibly stressful. 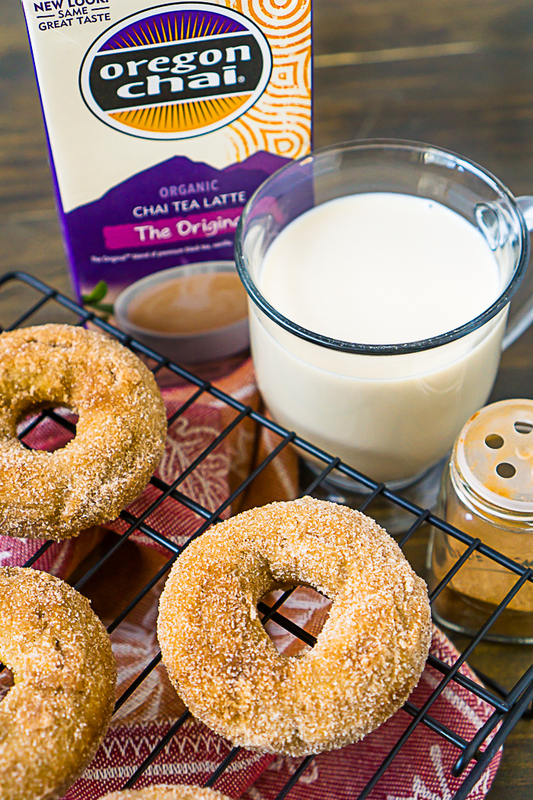 Taking time to slow down and enjoy some me time will make the holiday season far better, especially when it involves eating a fresh batch of Chai Baked Donuts next to a warm mug of Oregon Chai® Tea! In case you are wondering, No! There is no such thing as too much chai! 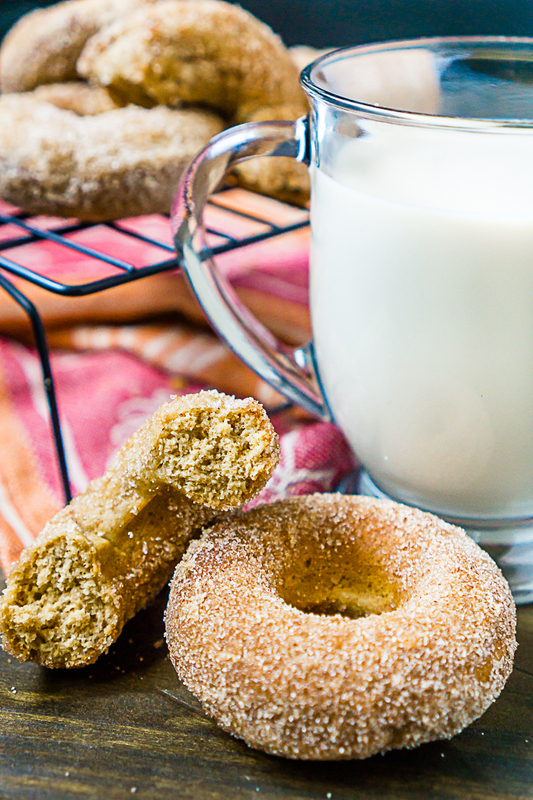 Baked Chai Donuts are Filled with Fabulous Chai Spices Everyone Will Love! ‘Tis the season to be jolly, as well as overworked, stressed, and downright exhausted! Between 4th quarter work, holiday parties and general holiday prep, the weeks between Thanksgiving and Christmas are basically a blur. In the past, I would just let it consume me and realize it was January in a blink of an eye. I’ve made it a goal this year though to slow down and take moments for myself even when it’s really hard to do. I’m a pretty simple gal when it comes to me time. Give me something tasty to eat while I relax in bed alone with a warm chai tea latte and a book, and I am happy. Bonus points if I get to eat a donut like this Baked Chai Donut. It’s soft and flavorful with the perfect cinnamon sugar coating. It doesn’t get much better then that! 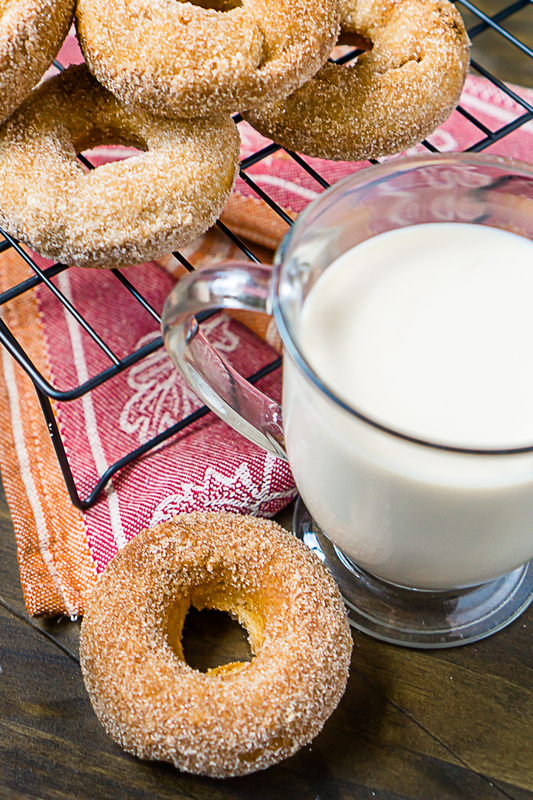 With chai tea lattes gaining more and more popularity, these donuts are sure to be warmly received at any holiday event! Giving yourself a sweet, spiced break in your week is going to make the holidays so much better in the long run because you will be more relaxed and centered. Isn’t every holiday better with homemade donuts?! I had been afraid to make a batch of donuts for so long because I thought they were hard to make, but baked donuts are actually really simple. The first batch I ever made was my Lemon and Blueberry Baked Donuts, and these Baked Chai Spiced Donuts definitely won’t be the last baked donut recipe on the blog because I love them too much! When making baked donuts, it’s important to know ahead of time that the texture is different then fried donuts. They aren’t quite as light and fluffy, but I personally think they last longer than fried donuts, which I love during the holidays! Make sure you have a great donut pan! Don’t over mix! You want to stir just enough to combine all the ingredients. You want the batter thick! If it wasn’t thick, your donuts would not rise in the pan and give you the domed donut shaped. Make sure to grease your donut pan well so the donuts don’t stick on you! I prefer to use baking spray. Use a piping bag or ziplock bag to pipe the batter into the donut pan. Do not over bake your donuts. When you test with a toothpick, I usually like to see some moisture or even a couple small crumbs on the toothpick when I pull it out. I also use the sides of my donuts as a guide and want them to just be turning a slightly golden brown color; no more! When deciding what chai to use for this recipe, Oregon Chai Tea at Meijer was an easy choice because Oregon Chai The Original 32 fl oz container is a delicious chai concentrate. You are getting a ton of spiced flavor with a small amount added into the batter, so it’s always my preferred chai ingredient! Plus, I love making both a hot chai latte and an iced chai latte with their concentrate. All I need to do is add milk (or a milk substitute). Making a delicious, creamy chai latte at home is so easy with Oregon Chai which results in an indulgent treat for me that’s better-for-me alternative compared to other gourmet flavors. Plus, Oregan Chai The Original and Slightly Sweet are organic and non-GMO! Meijer has a special mPerks offer for Oregon Chai so now is an awesome time to give it a try, especially since there are so many tasty chai recipe ideas to try out! 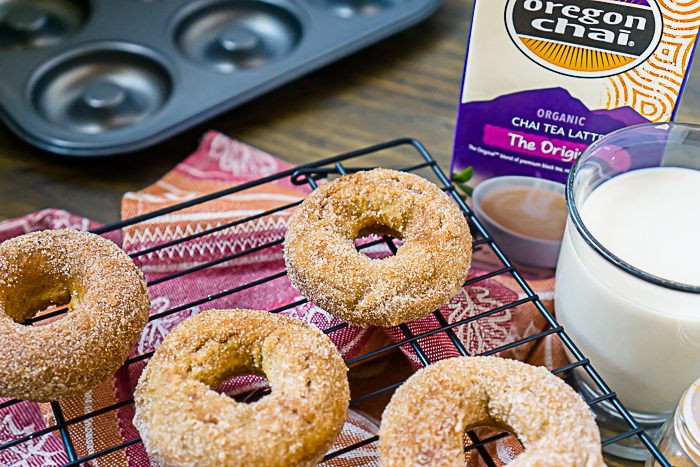 Then, make sure to pick up a container of either Oregon Chai The Original, Sugar-Free or Slightly Sweet when you are in Meijer next so you can whip up these tasty Baked Chai Donuts for your me time or your holiday breakfast with family if you are in the sharing mood! I found my container on the very bottom shelf in the tea aisle. 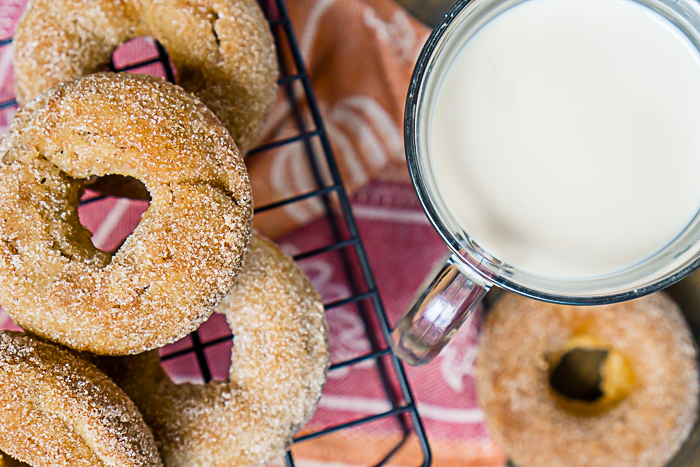 Now it’s time to enjoy these Baked Chai Donuts! In a large bowl, add the butter, oil and brown sugar. Whisk for a couple minutes until smooth and fluffy. Add in the chai, egg, vanilla, cinnamon, cloves, allspice, cardamon and ginger. Whisk until smooth. Add batter to a large disposable freezer bag (or piping bag). Cut off the corner of the bag. Pipe the batter into each donut hole. You want a smooth, even piping of the dough if you want smooth, evenly shaped donuts. The donut hole should be filled about 2/3 full but do not over fill. Bake for 8-10 minutes. I like my edges to just start to brown a little and a toothpick inserted comes out clean. Then let cool 5-10 minutes before removing from the pan to cool completely. Once cooled and ready to coat, melt butter in a shallow bowl. Dip donuts in butter completely. Toss in cinnamon sugar coating, and then put on cooling rack to finish cooling.